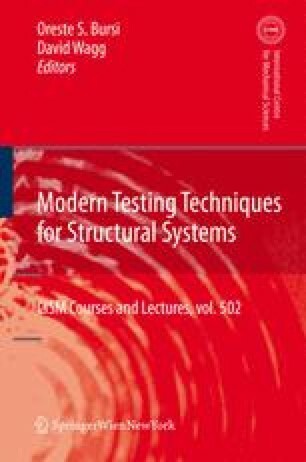 This chapter reflects the first of the four lectures that the author has presented at Udine, Italy, at CISM-International Centre for Mechanical Sciences, in June 2007, in the aim of the course “New Approaches to Analysis and Testing of Mechanical and Structural Systems”. He is being managing experimental activities in seismic engineering since 1993, when LNEC (the Portuguese National Laboratory for Civil Engineering) has started the construction of a large triaxial shaking table at the new earthquake testing hall of its Structures Department. Following a presentation of the main objectives of the Seismic Engineering experimentation, a brief state-of-the-art is made concerning its main laboratory methodologies, with a more clear focus on the shaking table tests. The leading problems related to the main testing methodologies (static, pseudo-dynamic, and shaking table) are identified and discussed. The advantages and disadvantages of each one are also highlighted. Moreover, a brief presentation of the centrifuge tests is introduced and, finally, the future developments needed are identified.